• Custom printed with company name, promotional message or event. 1 to 4 Lines , 35 characters (including spaces) maximum per line. or select individual color when ordering. I ordered 100 monogrammed pencils for the guests to use at a bridal shower. The pencils arrived earlier than I expected and they were perfect in color and inscription. They were a hit and the guests took them home as favors. The bride to be and her family were amazed. I will definitely order from Ink Spot again. 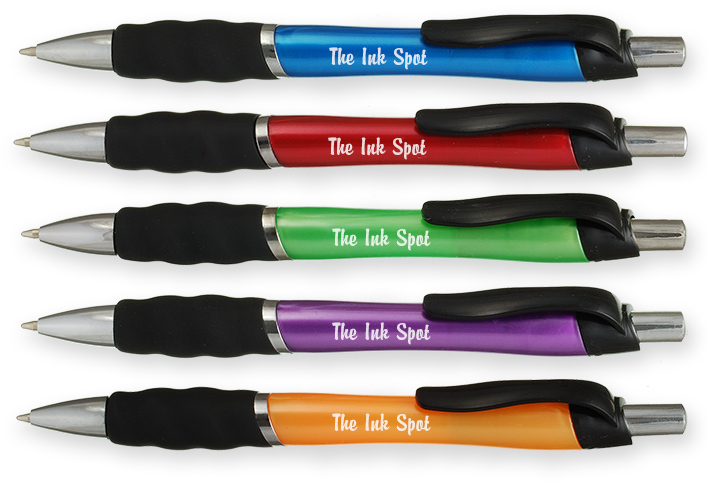 Super-fast turnaround time, quick response from customer service, and the pens look great. The ink pens were exactly as requested and arrived super fast! Very satisfied! Shipping was SOOO fast. They had the best prices I could find anywhere. And the pens look great! I even was able to use my own image and they're perfect! I received exactly what I ordered. No complaints. Your free shipping! I live in Alaska and unfortunately many businesses in the lower 48 states add a HUGE shipping fee onto the orders. Plus, my order actually came faster than I expected. Thank you. Great product. Our colour was back ordered but they offered us another choice. They were prompt and efficient. Would re-order from them in the future. The order was fast and good! !